Steven awakes to find a note on his pillow. Claudia has taken off for Peru. I don't know how Steven did not notice this earlier. Maybe, he had too much champagne at Fallon's walking celebration. Claudia arrives in Lima and is greeted outside by the reception of the hotel who asks if she has a reservation. Somehow, Pat Dunn, who happened to go to school with Matthew, instantly determines that Claudia Carrington is the former Claudia Blaisdel. He also instantly determines that Claudia has come down to Lima (2 years after the fact) to see what had happened to Matthew and Lindsey. Alexis advises Steven that he should send a shrink down to Lima to look after Claudia when she has her inevitable break down. Steven has a better idea. He goes down to Lima to help Claudia and he makes it just in time. That Pat Dunn person really just wanted to get Claudia in the sack. Now, Claudia was not willing but Steven's announcement of being Claudia's husband put Pat in his place. 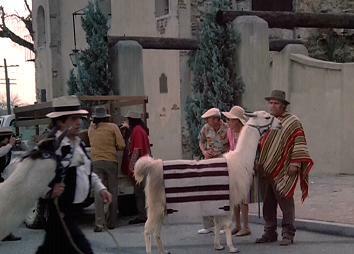 There are alpacas, it has to be Peru! Steven and Claudia are escorted into the jungles of Peru where they are shown Matthew and Lindsey's burnt out jeep. There is no sense trying to remove the jeep since the jungle consumes everything, including the bodies of Matthew and Lindsey. Yes, their bodies were not found because they probably became animal food. Such a thought rightfully horrifies Claudia. What more evidence Claudia need? Blake is ready to take Krystle to Hong Kong and deal for the leasing rights to the oil in the South China Sea. As they prepare, Krystle feels a pain in her head, and Tracy lets it slip that Krystle may be pregnant. That was rather presumptuous of her. Krystle tells Blake she had gone to see an obstetrician and there may be a chance she is pregnant. While dining at La Mirage, Krystle gets the good news that she is pregnant. For getting knocked up a second time, Krystle received a beautiful fur, a chauffeur with a new car (a new chauffeur cannot drive an old car), and a beautiful necklace. Krystle finds it extravagant but she earned it. Unfortunately, that means Krystle cannot go to Hong Kong with Blake. No matter, Tracy can do it. Wait, why is Tracy is still working at Denver Carrington? I thought she became head of public relations for The Party. Blake and Tracy fly off to Hong Kong. Just Blake's luck, he is met by Rashid Ahmed who claims that he will be negotiating on behalf of the government. Blake does not want to do any dealing with any Ahmed, but he also wants those leases. He contacts Adam, who happens to be at Colby Co, and tells him to find out whether Ahmed is legit. At the same times, Blake tells Adam not to let Alexis know what he is doing. Well, if Blake wanted to keep that a secret from Alexis, he probably should have not told Adam anything while he is the same room with his mother. Adam does not say a word but he does happen to write "Rashid Ahmed" and "Leases" on Alexis's notepad (Adam could not remember that) . Alexis does the old pencil trick to see what Adam had wrote. Now, her interest is piqued. Alexis makes a call back in her penthouse to find out why Blake is in Hong Kong - a phone conversation Mark intentionally overhears. Mark is going to get the goods for Neal. Once Blake learns that Ahmed is legit, he is willing to deal with him but as long as Tracy is in the room as a witness. After some hard fought negotiations, Blake does get the option for the leases for $100 million. Even though Blake does not have the $100 at the moment, he gives $5 million in good faith and has thirty days to come up with the rest. After the deal is signed, Tracy wants to go over a few last details and needs to get her notes from her room. She returns with the notes and a negligee in a box. Tracy holds up the negligee and asks if Blake wants one for Krystle. Blake kind of knows the deal and politely asks Tracy to leave since he is waiting for a call from Krystle. Gee Tracy, you really thought you were going to seduce a man who just married the woman he loves and is carrying his child. Next time, pursue a man who is not happy in his relationship. Jeff has a proposal for Fallon. No, it's not a marriage proposal. Jeff wants to whisk Fallon away to Aspen. Fallon is game. The two enjoy themselves and make love, of course. The two may actually have a normal courtship this time. But, there is a problem. Fallon is starting to have headaches. Jeff thinks that is normal since she did fracture her skull in the car accident. Claudia and Steven return to Denver and Claudia is glad that the issue with Matthew and Lindsey is settled. Nothing is settled so easily. Claudia receives a phone call and the voice on the other end sounds like Matthew telling Claudia that he and Lindsey need her and they need to be a family. Clearly, who ever is playing this cruel joke on Claudia purchased Season 1 of Dynasty on DVD because the voice said exactly what Matthew told Claudia in the diner scene in the first episode when he gets Claudia to come home. Claudia is so shocked by the voice that she passes out. Don't they always. 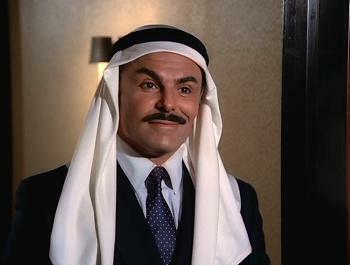 Rashid: As for the rest of the deal, you have my hand on it. Blake: I'd rather have it in writing, Ahmed, if you don't mind.